The Austro-Hungarian army that attacked Russia and Serbia in August 1914 had a glorious past but a pitiful present. Speaking a mystifying array of languages and lugging obsolete weapons, the Habsburg troops were hopelessly unprepared for the industrialized warfare that would shortly consume Europe. As prizewinning historian Geoffrey Wawro explains in A Mad Catastrophe, the disorganization of these doomed conscripts perfectly mirrored Austria-Hungary itself. For years, the Empire had been rotting from within, hollowed out by complacency and corruption at the highest levels. When Germany goaded Austria into starting the world war, the Empire's profound political and military weaknesses were exposed. By the end of 1914, the Austro-Hungarian army lay in ruins and the course of the war seemed all but decided. 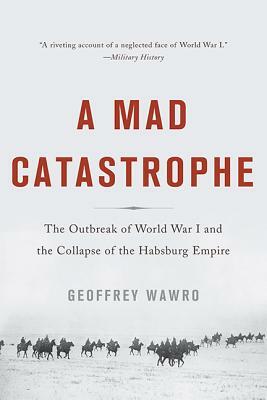 Reconstructing the climax of the Austrian campaign in gripping detail, A Mad Catastrophe is a riveting account of how Austria-Hungary plunged the West into a tragic and unnecessary war. Geoffrey Wawro is professor of history and director of the Military History Center at the University of North Texas, and the author of six books, including Sons of Freedom: The Forgotten American Soldiers Who Defeated German y in World War I and The Franco-Prussian War: The German Conquest of France in 1870-1871. Wawro lives in Dallas, Texas.